In 2013, a camera crew was allowed access to a highly secret and extremely dangerous society. The crew followed a group of New Zealand based vampires who share a house together. The filmmakers also interviewed them about their daily routines. Vampires, Viago (Taika Waititi), Deacon (Jonathan Brugh), and Vladislav (Jemaine Clement) talk freely and frankly about the challenges of being the undead. What We Do In The Shadows tells their story. The night after I watched Cartel Land, I was scheduled to view The Act Of Killing. However, I just didn’t feel ready for another harrowing documentary experience. Cartel Land was still very much with me - its bleak atmosphere lingering (however, I would still wholeheartedly recommend this documentary - click here for my Cartel Land Review). As a result, I selected What We Do In The Shadows. I figured that it was still in keeping with my documentary theme being as it is (if you hadn’t already guessed), a mockumentary. This film is fun. Having had years of angsty vampires, it is great to watch a movie that brings them down to such mundane issues such as whose turn it is to do the dishes. 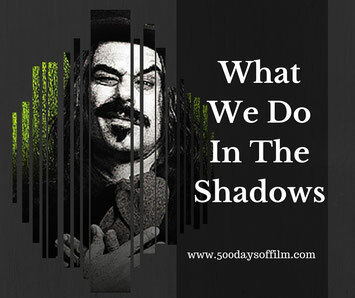 What We Do In The Shadows is really silly and your enjoyment of this film will largely depend on whether you are willing to go with it or not. I was in the right frame of mind and so I enjoyed this film. It features many scenes that made me laugh. The movie plays with all of the key vampire myths. For example, Viago has great fun with the fact that he has no reflection. Meanwhile, Vladislav finds flight extremely useful when getting rid of those hard to reach cobwebs. However, it is not all fun and games. The vampires all feel frustrated by the fact that they cannot enter nightclubs without first being invited in - much to the bemusement of local bouncers. At first, What We Do I The Shadows felt, to me, like a pretty low budget production. I was, therefore, surprised by the effectiveness of the film's special effects. Sadly, by the halfway point of of this film, I started to feel a bit fidgety. The movie just seemed to lose its way. I was happy to keep watching but felt that the film ran out of ideas by the end. Despite this, What We Do In The Shadows certainly proved a welcome breather from my rather harrowing documentary series and I would recommend it if you fancy something a little bit silly. This film was written and directed by Jemaine Clement, Taika Waititi who play Vladislav and Viago. Have you seen What We Do In The Shadows? If you have, what did you think of this vampire mockumentary? I’d love to know - just leave me a comment in the box below.